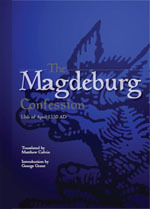 A new English translation of a very important historical confession has recently been released for sale: The Magdeburg Confession of 1550. Until this edition was published in the fall of 2012, I believe it has only been available in Latin and German. It may not be in print for long, so make sure to get it sooner than later. The pastors of Magdeburg issued this confession on April 13th, 1550, as a response to the tyranny of Charles V.
What constitutes a tyrannical government? How ought Christians to behave when faced with conflict from their own tyrannical government? Are Christians supposed to obey a tyrannical government without limitations? If so, what are those limitations? These questions and others are answered by the pastors of Magdeburg in their Confession. In response to Charles the fifth's tyranny, they declared, "Divine laws necessarily trump human ones." This English translation is translated by Dr. Matthew Colvin, who holds a Ph.D. in Latin and Greek Literature from Cornell University. It contains a detailed historical introduction by Dr. George Grant, Pastor of Parish Presbyterian Church, Founder of New College Franklin, President of King's Meadow Study Center, Founder of Franklin Classical School, and author of dozens of books in the areas of history, biography, politics, literature and social criticism. The foreword is by Matthew Trewhella, Pastor of Mercy Seat Christian Church, Milwaukee, WI.